ARMANDO EMÍLIO GUEBUZA, President of Mozambique, said the multiple challenges currently facing the world required a multilateral approach in order to develop consensual, effective and sustainable responses. For that reason, there was a need to focus on dialogue, inclusive governance, accountability, transparency and respect for human rights, he said, welcoming the session’s focus on mediation. He also noted that the session was not only taking place on the fiftieth anniversary of the death of Dag Hammarskjöld, but also 25 years after the assassination, “by apartheid”, of his country’s first President, Samora Moises Machel. Mozambique called on the international community to honour those two people, who had given their lives for mediation and preventive diplomacy, by redoubling commitments to initiatives aimed at building a world free of conflict. However, mediation should be conducted in an objective, impartial and neutral manner, ensuring the involvement of stakeholders at all stages and their ownership of the process, he stressed. Under those principles, Mozambique was proud to be part of mediation processes in Southern Africa that had helped other countries return to the path of socio-economic development. In that light, he appealed for appreciation of the mediation role played by regional and subregional organizations, and saluted the recent signing of the road map for a return to constitutional order in Madagascar as the culmination of a negotiation process mediated by the Southern African Development Community (SADC) which had started in 2009. Calling on the United Nations to assume full responsibility for the peaceful settlement of disputes, entrusted to the Organization by its Charter, he said it should strengthen the relationships among its organs as well as its own links with regional bodies. He also renewed his country’s commitment to reform of the United Nations that would make the world body more effective and proactive on peace and security as well as other issues. Mozambique called for completion of the General Assembly’s revitalization, which would endow it with the necessary authority and competence as well as adequate resources. The Security Council, for its part, should follow the evolution and dynamics of contemporary global challenges, in a transparent, inclusive and democratic manner, and assume its vital role in building the credibility of the United Nations as a universal entity. Regarding social and political developments in North Africa and the Middle East, he called on all actors to engage in constructive dialogue and to work for peaceful solutions. Internal dialogue, regional cooperation, and fairness regarding international intervention were crucial, he stressed. On the Israeli-Palestinian conflict, he urged the parties to commit themselves to the re-launch of negotiations towards concrete actions aimed at realizing a lasting, comprehensive and fair solution. He also reiterated unequivocal support for the cause of the Palestinian people and a two-State solution based on 1967 borders. 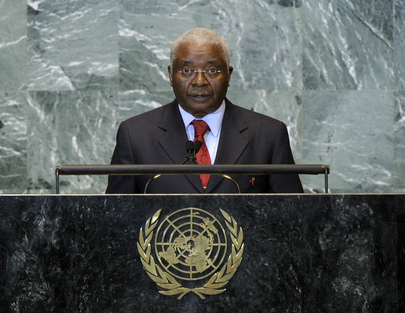 Similarly, Mozambique reiterated its support for a sustainable solution in favour of the legitimate right of the people of Western Sahara to self-determination, he said, praising also efforts by the international community to alleviate the suffering in East Africa, where people were suffering from drought and famine.